Touchstone Pictures, widescreen 2.35:1, languages: English (DD 5.1), French (2.0), subtitles: English, single side-dual layer, scene selections-22 chapters, rated PG-13, 169 min., $29.99, street date 11/10/98. Directed by Robert Redford. Starring Robert Redford, Kristin Scott Thomas, Sam Neill, Dianne Wiest, Scarlett Johansson. "...The alliance with man would forever be fragile -- for the fear he'd struck into their hearts was too deep to be dislodged ... Since that Neolithic moment when a horse was first haltered." " ... For secrets uttered softly into troubled ears, these men were known as The Whisperers ..."
Robert Redford directs and stars in this poignant story of 14-year-old Grace MacLean (SCARLETT JOHANSSON) who is emotionally and physically scarred after suffering a terrible riding accident while astride her prized horse, Pilgrim. 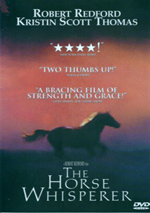 Realizing that the fates of her daughter and the horse are inextricably linked, Grace's mother, Annie (KRISTIN SCOTT THOMAS), a high-powered magazine editor, launches an all-out campaign to find a "horse whisperer," someone with a unique gift for curing troubled horses. She learns of Tom Booker (ROBERT REDFORD) known to be a legend for this sort of work and packs up both Grace and Pilgrim to seek his help in Montana. While Tom works to rebuild all the lives that have been shattered by the accident, love blossoms between the gentle horseman and the uprooted sophisticate, a love with both wonderful and tragic consequences in Touchstone Pictures' romantic drama, "The Horse Whisperer." There is no way I would be able to muster the patience to sit through this strikingly beautiful, but equally languid film in the theater. Unless the theater management encourages me to get up and run around a few laps in the auditorium during the 169 minutes span of the film. With today's viewing habit of moviegoers, long length feature film such as The Horse Whisperer (Titanic an exception) is better served during the home release. At the same time, the breathtaking cinematography is a main attraction of The Horse Whisperer which can only be fully appreciated in the theater with the exact intended composition by the director. Nevertheless, I am glad that such long feature length movies are still made and while I am guilty of not patronizing during the theatrical release, the picture captures my interest on the home front. The Horse Whisperer is the first film that Robert Redford served not only as the producer and director, but also as the star. In a unique approach, the film was shot and shown in theater with the aspect ratio of 1.85:1 and 2.35:1 respectively. In the Manhattan setting, the film was shot with 1.85:1 as a way to express the clutterness and chaotic lifestyle of the big city. As the family journeys to Montana, the scope setting widened to 2.35:1 in projecting the simplicity and peacefulness of nature. The framing of the DVD is closer to 2.35:1 for both settings. Thus, the effect is diminished from Redford's original intention. Furthermore, I feel that some close-ups of the 2.35:1 framing are too tight, forehead and chin are letterboxed out by the black bars. While this is a minor distraction, there are two instances where digital artifacts betrayed the integrity of the shot. A very noticeable jittering effects show up on my Panasonic A110 on two landscape backdrops. The hills look like it were moving as the compression cheated a few frames out of the setting. Hopefully something like this will not become an issue as the compression technology continues to improve. With that aside, the rest of the picture is gorgeous. The majority of the story takes place in Montana and the cinematography of Robert Richardson (Platoon, Wag The Dog) embraces the spectacular landscape with many wide-open shots. The images are post card perfect of rugged mountains, snow-covered plains, breezy field of wheats, pillowing clouds, and silhouette vistas. The lighting is serene and natural. Soft filter lenses are used to gently bounce amber-gold light off the characters or casting silhouette against the backdrop of majestic sunset skies. One can not watch this film without being captivated and inspired by the landscape and lighting. Images of the transfer are detailed with fully saturated colors and no grains. Blacks are glossy and shadow details is clearly defined. The encoded Dolby Digital soundtrack is not particularly powerful and there is little reason to be for a film that is mostly dialogue driven. There are a few scenes where the sound is very dramatic such as the harrowing accident scene of the horse and truck that I had to literally brace myself watching the impact. The score by Thomas Newman (Shawshank Redemption, Meet Joe Black) complements the Western landscape with solo piano and soft violin surrounded by orchestration, but refrained from reaching a melodramatic stage. The recording is expansive and rich in clarity and provides most of the ambience. Sound effects such as horses and distant thunders are spatially integrated. For a film that I wouldn't be able to sit through in the theater, I watched the DVD twice at home on the first couple days I got it. To see the film, you have to sprawl on the sofa, settle into a comfortable position, and ready to be mesmerized by the stunning imageries and a deliberate but satisfying story.